Start Here for Bra Help! A classic camisole, or silk cami is a wardrobe staple. It’s one of those things that can have a great place in almost any wardrobe. However, they often get overlooked when creating a look. Sometimes that’s because it’s hard to place a camisole. Is it an undershirt? Is it lingerie? Is it something you can wear everyday? 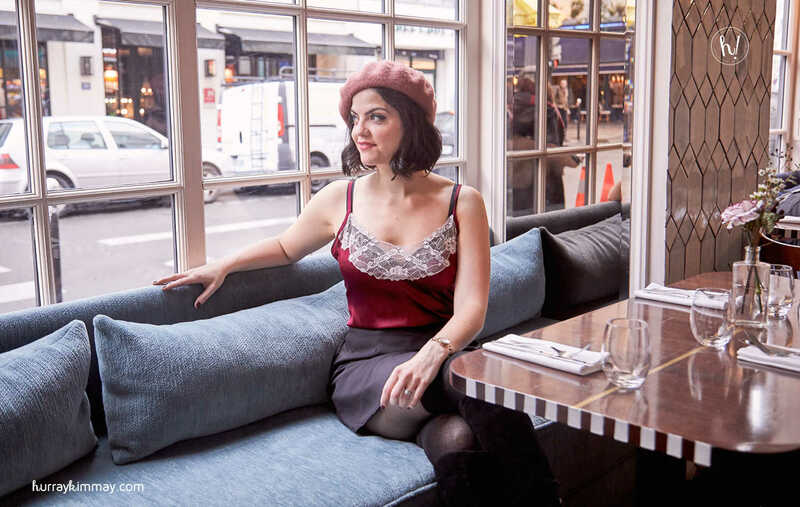 To answer these burning questions I decided to style a silk camisole 5 different ways: from around town to the office, to bed or out with your honey, and even for modesty! In fact, I took a silk cami to Miami and Paris to showcase the versatility of this wardrobe staple. Hopefully, these ideas will give you some inspiration to say hurray and give new life to your outfits. Give some a try or share your style ideas with me! This post is in partnership with The Giving Bride. You’ll see information about the brand and what I’m wearing along the way, with lots more information at the bottom of this post. Huge hurrays for them! You may also see some affiliate links which help me keep this blog going. And remember, I always share my honest opinion and make sure I can truly stand behind brands I share. The camisole I chose to wear for this is The Tyler Cami from The Giving Bride. It’s 93% silk and a gorrrrgeous burgundy or wine color (it comes in other colors, too) with spaghetti straps, and the sweetest touch of silver lace. So divine! I’m wearing the size small here, but this style does not have much stretch with 7% spandex. Because the lace is slightly see-through and dips low on the bust, I also paired a bra that I didn’t mind letting peek through with each outfit. It was actually fun to choose a bra to be a part of the outfit! Of course you can go sans bra, but I prefer the support and style of bras and lingerie. Take a look at the style notes in each section for more information on what I’m wearing underneath each look, and scroll to the bottom of this article for way more information on The Giving Bride and their amazing collection of lingerie and loungewear. A silk camisole is such a classic staple, and so are jeans! For a casual and cool look, pop on your favorite jeans and a simple silk camisole for an easy look. You can dress it up with heels or keep it cool like I did with these wedge sandals in Miami. I added in a pair of sunglasses and I was ready to hit the town! One of the best things about wearing a camisole is that it’s easy to layer something over it. So if you want to throw on a cardigan or leather jacket for warmth, preference, or style choice, you can do so without bulky layers getting in the way. Hurray! Style Notes: Wearing The Giving Bride camisole, NY & Co Jeans, the comfiest Dr. Scholl’s wedges, and Lafont Sunglasses while on a #HurrayVacay in Miami. Underneath I’m wearing a wine colored, Aimee t-shirt bra from Dominique. Ooh la la! This gorgeous camisole was so easy to dress up for a night out on the town. Whether you’re meeting with your honey, a friend, or you’re on a date with yourself – getting dressed up is so easy with a silky, beautiful cami! I paired mine with a skirt and tights, but you can put this with a pair of high waist slacks, or a gorgeous maxi skirt, or other favorite date night attire. When it comes to dressing your best for a date I always advise you to wear something that feels very YOU. Because being yourself and sharing your heart with someone is most easily done when you’re comfortable being your full self. Styles notes: This photo was shot at Cafe Panache in Paris during a #HurrayVacay trip. I paired the Tyler Camisole with a black mini skirt, courtesy of Tobi. I’m also wearing a pair of Secret Socks stocking from Pretty Polly, and a gorgeous pair of suede boots from Dr. Scholl’s. I bought this beret (I have so many now!) from NY & Co. Underneath I’m wearing a beautiful Melody Plunge black lace bra from Empreinte. Boss babe alert! I’ve owned my own business since 2014, and I always stayed away from blazers. I thought they were too cooperate, and I was leaning into a totally different path for business ownership. But once I let go of my fears of looking too cooperate, and misunderstandings about what it means to me to be a woman in business, I found a new freedom. And with it came the ability to wear and try things that I once judged as boring or too business-y. That 100% includes the blazer. I feel like blazers are such an easy layer, and they can elevate a look instantly. This is especially true over a pretty camisole. Sometimes a cami on its own can feel too bare or unstructured, so a well fitting blazer can provide a bit of coverage and some strong lines. If that’s what helps you stand in your power and make moves in your job – Hurray! 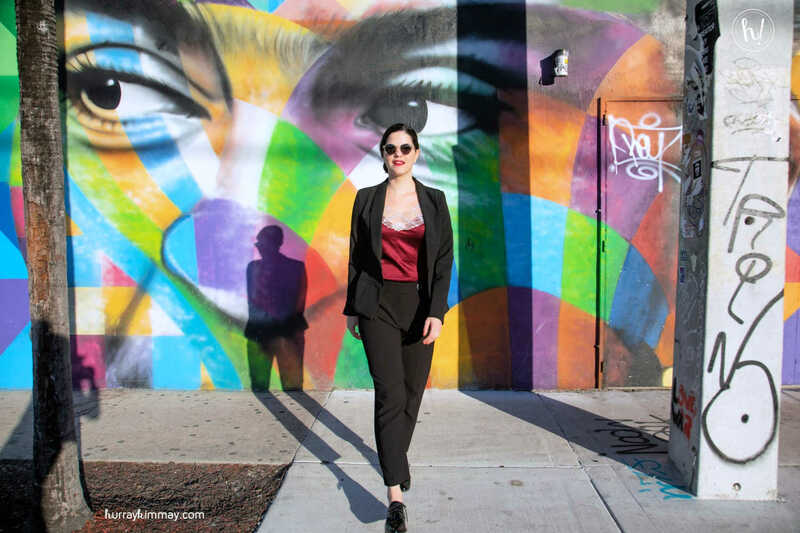 Style notes: This photo was taken in the very cool Wynwood area of Miami, during a #HurrayVacay trip. Of course I’m wearing the Tyler Camisole from The Giving Bride. I’m also wearing a pair of pants I found at Camaieu in Paris, a blazer thanks to Tobi, sunglasses courtesy of Lafont, and these patent leather oxford shoes I found on Amazon (they have almost a sneaker bottom and are surprisingly comfortable! And I put arch supports in just about every pair of shoes.) Underneath I’m wearing the Amiee t-shirt bra from Dominique. This silky camisole is part of a set! It has a matching tap pant, or short. I was tempted to think that this was too luxurious to wear to sleep, or for just around the house. But the truth is that sleeping in it and wearing it around just for myself helped me feel like a queen! And once I wrapped up in a silk robe, too, I was feeling like a goddess. I’m always tempted to save nice things to wear around or even for other people. So this was a reminder that dressing luxuriously for myself is another way to say hurray! Style Notes: Wearing the Tyler Camisole and the matching tap short from The Giving Bride. Plus, this matching silk eye mask (love to wear eye masks!) and the Nora silk kimono style sleeve robe, both from The Giving Bride. Underneath I’m wearing a wire-free black bralette in size 32D/E from Montelle. You can totally sleep or lounge in a wire-free bra, or go sans bra! This (oh you know, casual photo of me having coffee on my balcony with the Eiffel Tower, NBD) photo was taken in an epic apartment in Paris during my #HurrayVacay stay there. Sometimes a camisole can act as an underlayer. And they can be especially useful for wearing underneath a plunging neckline, or a dress or blouse with a deep cut back, or low arm holes. Making it a beautiful, layered look and incorporating the camisole into your outfit is a stylish step up from something like a plain, stretchy camisole. And, you can have the same modesty effect. Hurray! Styles Notes: I borrowed this top from the photographer, Becky Yee! Also wearing shorts from Tobi and Dr. Scholl’s gifted me these wedges that felt like walking on clouds. Sunglasses by Lafont. Underneath I’m wearing a black bralette in size 32D/E from Montelle. This photo was snapped in the Wynwood area of Miami during a #HurrayVacay getaway. Your Turn: How do you wear your camisole? 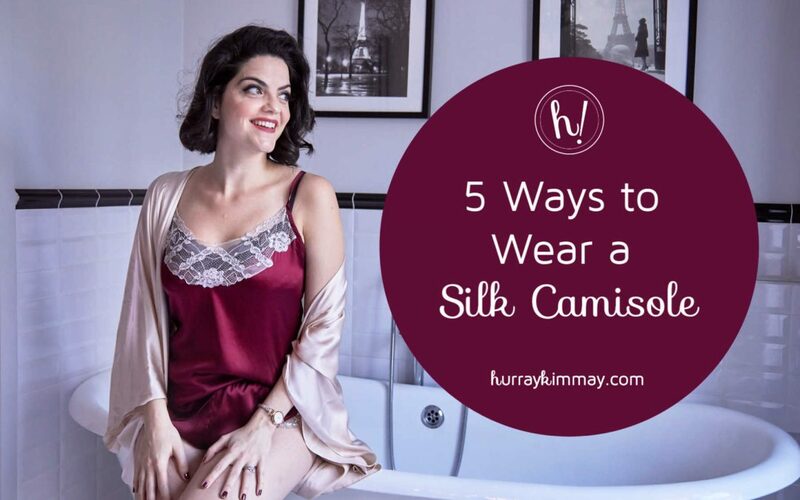 Have you ever worn a silk cami before? What style suggestion do you want to try? What style suggestions do you want to share? Leave a comment here and let’s say hurray together! Credits: Photos by Becky Yee during two #HurrayVacay trips in Miami and Paris. As always, zero airbrushing or photo shopping, so what you see is what you get! Makeup and hair by yours truly. Special thanks to Marseilles Hotel in Miami, and Hotel Panache in Paris. Additional thanks to a few brands for gifted products: Tobi, Dr. Scholl’s Shoes, La Font, and Pretty Polly. The Giving Bride is a lingerie brand that creates timeless looks for the discerning bride. Their classic styles are made from super luxe fabrics with high end finishes, and some pieces are embellished with French lace and Swarovski crystals. From chemises to camisoles, and capes to bralettes – each item is made in the USA and a portion of every purchase goes to women’s charities. I know Maggie, the owner of The Giving Bride, and am always so stunned by the beautiful work that she creates! On top of gorgeous items, she also hosts The Lingerie Selection, a high end trade show experience for luxury lingerie brands, most of which are independently owned by women. I adore her can do attitude and attention to fine details. And I’m proud to say that I have even partnered with her to host my women’s circles in her gorgeous Manhattan studio. Most of her items are investment pieces, and are suitable for occasions well beyond the bridal trousseau. Hurray!